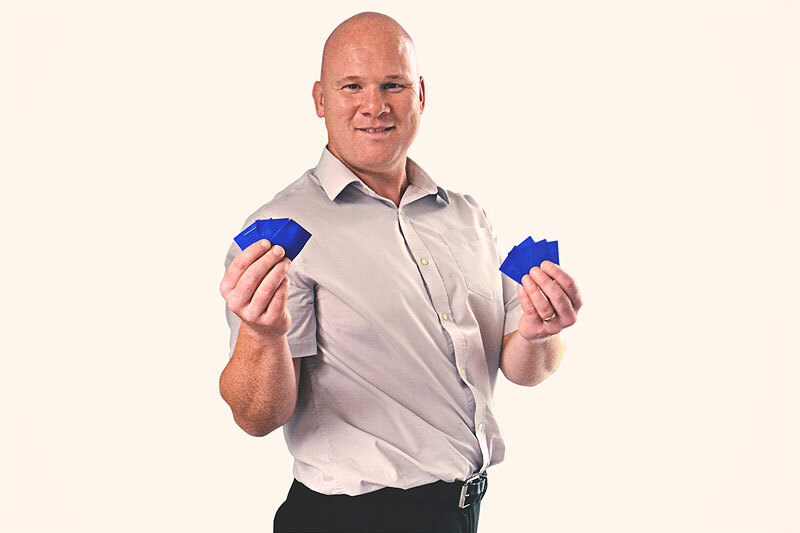 Our People at Viscose Closures, Stephen Armstrong, Production Manager! It takes 2 hours to track Stephen Armstrong down, potentially the busiest man at Viscose Closures…. We sit, with some time focussed on him, to learn about the man who manages production for the entire site of Viscose. Born and raised in Swansea, Stephen was the biggest baby to date to be born into Gorseinon Hospital. At 10lb 10oz, Stephen started life as he meant to go on, with gusto. His sister was 3 years his senior and 5 years later he had a third sibling a baby sister. His journey through school life wasn’t the conventional school, university, academic route. “I went to the University of Life” he says with his usual cheeky grin. People are very much at the centre of Stephen’s days, he carries this attitude right through to his home life. He has two young children called Sophie and George and a lovely wife Clare who are all very much at the centre of his world once he walks out of the doors of Viscose each day. As far as hobbies go, sports are the number one choice for Stephen, having recently completed the CARTEN 2016, a (casual?) 107-mile cycle event from Cardiff City Centre to Tenby City Centre. Finishing with a highly respectable time of 7 hours and 18 minutes, Stephen tells us of the emotional finish he had as his children and wife greeted him at the finish line. He also tells us about his next challenge, the Dragon Ride which he has lined up for the 5th June (a hefty 130 miles!). Stephen raised money for Noah’s Ark Children’s Hospital Charity for the CARTEN 2016 and will cycle for the Macmillan Cancer Support for his next cycle. 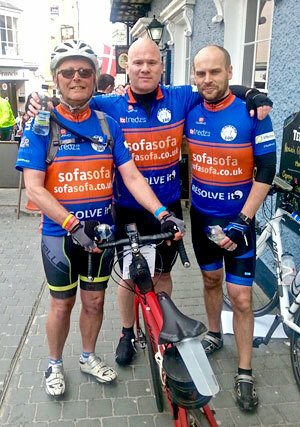 Stephen Armstrong at the finish line of CARTEN 2016 with cycle team-mate Marc Meadows and Rob Morgan, Finance Director of Viscose Closures LTD.
Stephen is clearly an advocate for young people who want to go far. His 2 awards at our annual Viscose Christmas Dinner (Most Resourceful Person & Best Painter & Decorator… yes, you read that right) are small pieces of evidence of Stephens day to day work ethic, attitude and motivation. In a final breath, we ask Stephen how he fits everything he does into one life. He says nothing, and grins! We hope you enjoyed learning more about Stephen from our team. If you would like to contact Stephen then please email Stephen.armstrong@viscose.co.uk. This entry was posted on Friday, May 13th, 2016 at 2:41 pm	and is filed under News.